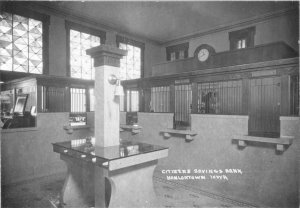 The former Citizens Savings Bank Building was designed by architect Einar Broatenby and constructed in 1919. 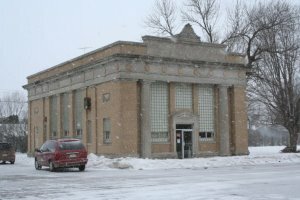 Broaten was born in Norway and is associated with several Prairie-style buildings in the Mason City area, several of which are listed on the National Register of Historic Places. The building was Commissioned and financed by C. H. MacNider. 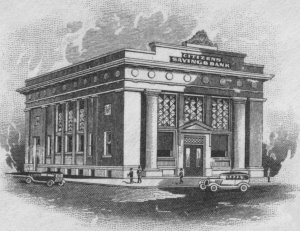 The bank opened in 1920 and closed in 2000. The the building combines elements from a variety of architectural styles. The exterior has a predorminantly Classical Revival style design, but a closer look reveals elements of other styles. The interior is predorminantly done in the Prairie School Style, and abounds with oak woodwork, stained glass and marble. Again a closer look revels clasical elements. Following its closing, two charitable foundations bought the building and donated it to the society. 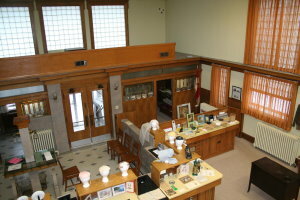 Intact features include the molded-plaster ceiling moldings, interior stained glass, drinking fountain, customer writing desk, quarter-sawn oak casings, moldings, interior office partitions, vaults and teller desks. Preserve Our Past, a Hanlontown committee, currently operates a local history museum in the building. 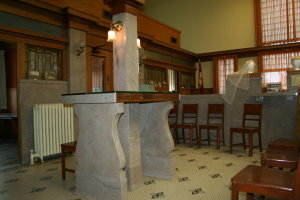 Plans to eventualy restore the main level to a banking museum may require moving the local history museum to the basement. There is a souvenir shop on the main level. The top photo on the right is the Architect's drawing of the building and the next is the interior from a 1920 postcard. The other photo's below are the building as it is today. Open: Sundays, 2 to 4 p.m. first Sunday in June through the last Sunday in August.